A picture-perfect setting helps Leavenworth in North Central Washington draw more than a million visitors a year. 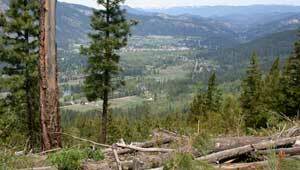 So when a thickly forested ridgeline in the direct line of sight from the world-renowned Bavarian village was slated for development, The Trust for Public Land partnered with the Chelan-Douglas Land Trust and Icicle Fund to conserve the nearly 170-acre property in 2009. Preventing development of 8 mega-homes on 20-acres home sites on the ridge preserves backcountry access and healthy forest habitat near Wenatchee National Forest and saves part of the town's most important asset, its unspoiled mountain backdrop.